The 'Missed Opportunity' Of Trump's Asia Trip : Parallels Asia experts say that while the president avoided major blunders on his five-nation visit, he missed more than one opportunity to offer his administration's strategic vision for the region. 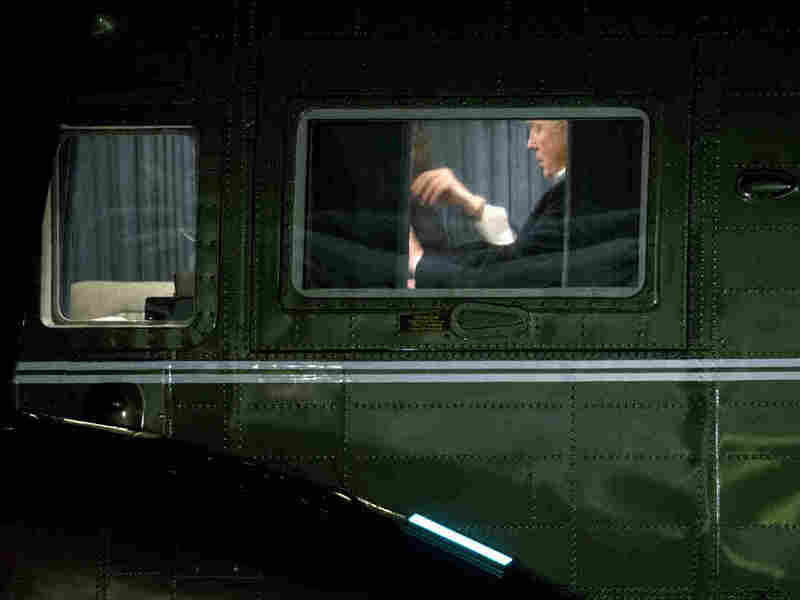 President Trump sits on Marine One on the South Lawn of the White House after returning from his Asia trip on Tuesday. When President Trump returned this week from a 12-day, five-nation swing through Asia, he gave himself high marks for the "tremendous success of this trip." But experts say that while he avoided major blunders during his stops in South Korea, Japan, Vietnam and the Philippines, the president missed more than one opportunity to offer his administration's strategic vision for the region — the world's largest, most populous and fastest growing. "It was all fluff," says David Shambaugh, a professor of political science and international affairs at the Elliott School at George Washington University. "Nothing came out of it except Trump flying in and being treated well himself." Shambaugh points to the lavish dinners, honor guards at nearly every stop and the tea to which the president was treated in Beijing's Forbidden City as "symbols" that the Chinese and "in fact, most Asian leaders, have figured out Trump" — by flattering his ego. The first two legs of the trip — to treaty allies Japan and South Korea — went mostly well. Trump reassured Japan's Prime Minister Shinzo Abe and President Moon Jae-In of South Korea of U.S. commitment; they in turn vowed to keep working toward the goal of a denuclearized North Korea and pledged some investments in the U.S.
"He did no harm," says Shambaugh. However, in China, the much touted $250 billion worth of deals were mostly memorandums of understanding or deals already in the works. "All countries dealing with us on trade know that the rules have changed," Trump said after he returned. But on the roughly $300 billion trade imbalance between the U.S. and China, Trump "didn't get any structural changes," notes Evan Medeiros, a managing director at the Eurasia Group and a former senior advisor to the Obama administration on Asia. More damning, say critics, was the president's flattery — he called him a "very special man" — of Chinese leader Xi Jinping. It seemed oddly dissonant after the recently concluded 19th Chinese Communist Party Congress, which saw Xi emerge as the most powerful Chinese leader in decades. "I think it sends chills down the spines of the leaders of the region," says Medeiros. Perhaps the most eagerly anticipated part of the trip was Trump's speech in Danang, Vietnam, to the Asia Pacific Economic Cooperation (APEC), a forum that promotes free trade throughout the Asia-Pacific region. Trump's speech to the body was billed to outline the administration's overall strategy toward what the administration now calls a "free and open Indo-Pacific." The heart of the speech, however, was a full-throated appeal to economic nationalism, in which the U.S. was "going to focus on its own interests," says Medeiros. That stood in stark contrast with the announcement on APEC's sidelines by 11 member countries that they plan to persist with the Trans Pacific Partnership — a multilateral trade deal negotiated by the Obama administration that Trump walked out of on his third day in office. Another "missed opportunity," says Alyssa Ayres, a senior fellow at the Council on Foreign Relations, was the administration's lack of articulation of a clear vision for the region. Trump's repeated use of the phrase "Indo-Pacific" followed a recent decision by the administration to redefine the "Asia-Pacific" region with a nod toward the growing importance of India and the role the administration would like the world's largest democracy to play in the region. The administration has, in parallel, resurrected a 2007 initiative involving Japan, Australia, U.S. and India known as the Quadrilateral Security Dialogue or "Quad," in which these four major democracies cooperate on helping set Asia's rules and norms. "If the overall Asia strategy is to expand the region and to frame it with India playing a larger role, which helps balance what has emerged as China's economic and military dominance, then that is a strategy that a lot of people can get behind," says Ayres. But it remains an "inchoate and underdeveloped strategy," Medeiros says, with a lot of questions surrounding it, especially in terms of what happens next and how it is formalized among these four countries. There's also a question of perception. While George Washington University's Shambaugh agrees with the resurrection of the Quad in principle, he wonders how the Chinese will react to it. "The Chinese don't like any attempts at encirclement or containment or security cooperation amongst the countries in their periphery," he says. All of this comes at a time when China is not only increasingly assertive in the region but is also lavishing it with infrastructure financing as part of its Belt and Road Initiative, aimed at improving trade ties and infrastructure all the way to Europe. Beijing has worked tirelessly to improve bilateral and trade relations with nearly every country in East and Southeast Asia. Although Secretary of State Rex Tillerson has said the U.S. needs to "counter" China's initiative, the administration so far seems to have no coordinated response. "The economic piece to this is quite vital," says Ayres, "and that is where there is a gaping hole." A previous version of this story referred to Japan's Prime Minister Shinzo Abe as president and South Korea's President Moon Jae-In as prime minister.